At VocabularySpellingCity headquarters, we collect vintage educational technology. We like to remember that we are not the first generation that is “revolutionizing” education. The leveraging and integration of technology into our lives has been a thrilling challenge and adventure for a hundred years now. Here’s some high points of the ongoing revolution, all items are from the VocabularySpelling Collection. This library card catalog is our most recent addition. It was donated by a local elementary school who said it was otherwise destined for the trash. When I was in school in the 1960s and 70s, learning these card catalogs and the associated Dewey Decimal System was an essential research skill. 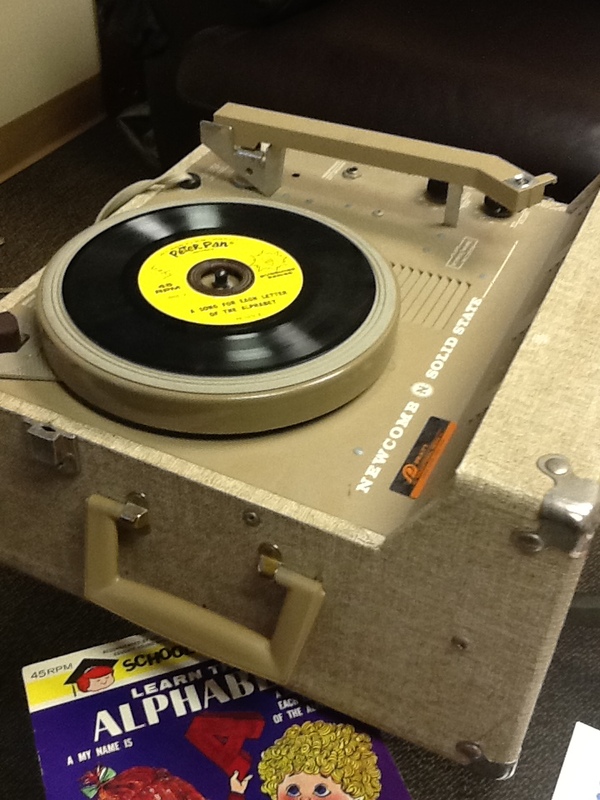 These record players were often used as part of an audio visual presentation with a film strip. The records (later audio cassettes) would start by explaining that this was an audio track to be used with the film strip and that a person would need to move the film strip forward when they heard a beep. Then, they’d explain that the film strip should be on the title page at this time. Finally, it would say that we are now going to play a beep and then you should move forward one frame. It was a great treat to be the student who was allowed to control the film strip projector. Another highlight of old technology in the collection is the typewriter. For a century prior to the introduction of electric typewriters, and digital word processors, there were typewriters which coupled with carbon paper, were the defacto when of creating formal documents. I’m sure that I’m not the only one who remembers that “cc” use to mean a carbon copy of the original was made. In the Retro Educational Technology Collection, there are lots more. Click through to see more the vintage educational tech materials in the SpellingCity HQ office collection. Here is a Standard Rocket 1961 mimeograph machine. I’m still looking for the electric version of this that was dominant during the 1960s and 1970s. I’d like to mention one other set of technologies which is rarely visible in schools any more, dictionaries and encyclopedia. I have in the collection two complete sets of World Bank Encyclopedias and an old style complete dictionary. ← Thanks for Bringing the Force of Words to Our StarWords Sweepstakes! muchos de estos artefactos formaron parte de mi educacion. Thank to you guys I am getting A”s on my homework. How come you don’t have an old style grade book on display? You know, those leather or vinyl covered books with the students in rows and each grade in a column? And where are your old school class pictures? I like spelling city, John!